1 A None No Power Seat 1 A is a standard First Class Open Suite seat whose proximity to the lavatory, galley and bar may be bothersome. 1 K None No Power Seat 1 K is a standard First Class Open Suite seat whose proximity to the lavatory, galley and bar may be bothersome. 10 A None No Power Seat 10 A is a standard Business Class Open Suite seat. 10 E None No Power Seat 10 E is a standard Business Class Open Suite seat. 10 F None No Power Seat 10 F is a standard Business Class Open Suite seat. 10 K None No Power Seat 10 K is a standard Business Class Open Suite seat. 11 A None No Power Seat 11 A is a standard Business Class Open Suite seat whose proximity to the lavatories and galley may be bothersome. 11 E None No Power Seat 11 E is a standard Business Class Open Suite seat whose proximity to the lavatories and galley may be bothersome. 11 F None No Power Seat 11 F is a standard Business Class Open Suite seat whose proximity to the lavatories and galley may be bothersome. 11 K None No Power Seat 11 K is a standard Business Class Open Suite seat whose proximity to the lavatories and galley may be bothersome. 12 A None No Power Seat 12 A is a standard Business Class Open Suite seat whose proximity to the lavatories and galley may be bothersome. 12 E None No Power Seat 12 E is a standard Business Class Open Suite seat whose proximity to the lavatories and galley may be bothersome. 12 F None No Power Seat 12 F is a standard Business Class Open Suite seat whose proximity to the lavatories and galley may be bothersome. 12 K None No Power Seat 12 K is a standard Business Class Open Suite seat whose proximity to the lavatories and galley may be bothersome. 14 A None No Power Seat 14 A is a standard Business Class Open Suite seat. A bassinet is available at this location for a passenger traveling with an infant. 14 E None No Power Seat 14 E is a standard Business Class Open Suite seat. 14 F None No Power Seat 14 F is a standard Business Class Open Suite seat. 14 K None No Power Seat 14 K is a standard Business Class Open Suite seat. A bassinet is available at this location for a passenger traveling with an infant. 15 A None No Power Seat 15 A is a standard Business Class Open Suite seat. A bassinet is available at this location for a passenger traveling with an infant. 15 E None No Power Seat 15 E is a standard Business Class Open Suite seat. 15 F None No Power Seat 15 F is a standard Business Class Open Suite seat. 15 K None No Power Seat 15 K is a standard Business Class Open Suite seat. A bassinet is available at this location for a passenger traveling with an infant. 2 A None No Power Seat 2 A is a standard First Class Open Suite seat. 2 E None No Power Seat 2 E is a standard First Class Open Suite seat. 2 F None No Power Seat 2 F is a standard First Class Open Suite seat. 2 K None No Power Seat 2 K is a standard First Class Open Suite seat. 20 A None No Power Seat 20 A is a standard Economy Class seat with additional legroom. There is no floor storage for this seat during takeoff and landing. The tray table and video monitor are in the armrest making the armrest immovable, therefore, slightly reducing seat width. A bassinet is available in this location, therefore, a passenger traveling with an infant might be seated in this row. 20 B None No Power Seat 20 B is a standard Economy Class seat with additional legroom. There is no floor storage for this seat during takeoff and landing. The tray table and video monitor are in the armrest making the armrest immovable, therefore, slightly reducing seat width. A bassinet is available in this location, therefore, a passenger traveling with an infant might be seated in this row. 20 D None No Power Seat 20 D is a standard Economy Class seat with additional legroom. There is no floor storage for this seat during takeoff and landing. The tray table and video monitor are in the armrest making the armrest immovable, therefore, slightly reducing seat width. A bassinet is available in this location, therefore, a passenger traveling with an infant might be seated in this row. 20 E None No Power Seat 20 E is a standard Economy Class seat with additional legroom. There is no floor storage for this seat during takeoff and landing. The tray table and video monitor are in the armrest making the armrest immovable, therefore, slightly reducing seat width. A bassinet is available in this location, therefore, a passenger traveling with an infant might be seated in this row. 20 F None No Power Seat 20 F is a standard Economy Class seat with additional legroom. There is no floor storage for this seat during takeoff and landing. The tray table and video monitor are in the armrest making the armrest immovable, therefore, slightly reducing seat width. A bassinet is available in this location, therefore, a passenger traveling with an infant might be seated in this row. 20 G None No Power Seat 20 G is a standard Economy Class seat with additional legroom. There is no floor storage for this seat during takeoff and landing. The tray table and video monitor are in the armrest making the armrest immovable, therefore, slightly reducing seat width. A bassinet is available in this location, therefore, a passenger traveling with an infant might be seated in this row. 20 J None No Power Seat 20 J is a standard Economy Class seat with additional legroom. There is no floor storage for this seat during takeoff and landing. The tray table and video monitor are in the armrest making the armrest immovable, therefore, slightly reducing seat width. A bassinet is available in this location, therefore, a passenger traveling with an infant might be seated in this row. 20 K None No Power Seat 20 K is a standard Economy Class seat with additional legroom. There is no floor storage for this seat during takeoff and landing. The tray table and video monitor are in the armrest making the armrest immovable, therefore, slightly reducing seat width. A bassinet is available in this location, therefore, a passenger traveling with an infant might be seated in this row. 29 A None No Power Seat 29 A is a standard Economy Class seat with limited recline and whose proximity to the lavatories may be bothersome. 29 B None No Power Seat 29 B is a standard Economy Class seat with limited recline and whose proximity to the lavatories may be bothersome. 29 D None No Power Seat 29 D is a standard Economy Class seat with limited recline and whose proximity to the lavatories may be bothersome. 29 E None No Power Seat 29 E is a standard Economy Class seat with limited recline and whose proximity to the lavatories may be bothersome. 29 F None No Power Seat 29 F is a standard Economy Class seat with limited recline and whose proximity to the lavatories may be bothersome. 29 G None No Power Seat 29 G is a standard Economy Class seat with limited recline and whose proximity to the lavatories may be bothersome. 29 J None No Power Seat 29 J is a standard Economy Class seat with limited recline and whose proximity to the lavatories may be bothersome. 29 K None No Power Seat 29 K is a standard Economy Class seat with limited recline and whose proximity to the lavatories may be bothersome. 30 A None No Power Seat 30 A is a standard Economy Class seat with additional legroom, however, the Exit Door protrusion and the proximity of the lavatories may be bothersome. There is no floor storage for this seat during takeoff and landing. The tray table and video monitor are in the armrest making the armrest immovable, therefore, slightly reducing seat width. 30 B None No Power Seat 30 B is a standard Economy Class seat with additional legroom, however, the proximity of the lavatories may be bothersome. There is no floor storage for this seat during takeoff and landing. The tray table and video monitor are in the armrest making the armrest immovable, therefore, slightly reducing seat width. 30 D None No Power Seat 30 D is a standard Economy Class seat with additional legroom, however, the proximity of the lavatories may be bothersome. There is no floor storage for this seat during takeoff and landing. The tray table and video monitor are in the armrest making the armrest immovable, therefore, slightly reducing seat width. A bassinet is available at this location, therefore, a passenger traveling with an infant might be seated in this row. 30 E None No Power Seat 30 E is a standard Economy Class seat with additional legroom, however, the proximity of the lavatories may be bothersome. There is no floor storage for this seat during takeoff and landing. The tray table and video monitor are in the armrest making the armrest immovable, therefore, slightly reducing seat width. A bassinet is available at this location, therefore, a passenger traveling with an infant might be seated in this row. 30 F None No Power Seat 30 F is a standard Economy Class seat with additional legroom, however, the proximity of the lavatories may be bothersome. There is no floor storage for this seat during takeoff and landing. The tray table and video monitor are in the armrest making the armrest immovable, therefore, slightly reducing seat width. A bassinet is available at this location, therefore, a passenger traveling with an infant might be seated in this row. 30 G None No Power Seat 30 G is a standard Economy Class seat with additional legroom, however, the proximity of the lavatories may be bothersome. There is no floor storage for this seat during takeoff and landing. The tray table and video monitor are in the armrest making the armrest immovable, therefore, slightly reducing seat width. A bassinet is available at this location, therefore, a passenger traveling with an infant might be seated in this row. 30 J None No Power Seat 30 J is a standard Economy Class seat with additional legroom, however, the proximity of the lavatories may be bothersome. There is no floor storage for this seat during takeoff and landing. The tray table and video monitor are in the armrest making the armrest immovable, therefore, slightly reducing seat width. 30 K None No Power Seat 30 K is a standard Economy Class seat with additional legroom, however, the Exit Door protrusion and the proximity of the lavatories may be bothersome. There is no floor storage for this seat during takeoff and landing. The tray table and video monitor are in the armrest making the armrest immovable, therefore, slightly reducing seat width. 41 G None No Power Seat 41 G is a standard Economy Class seat that juts out into the aisle and may be bumped into by other passengers and crew. 44 B None No Power Seat 44 B is a standard Economy Class seat whose proximity to the lavatory and galley may be bothersome. 44 D None No Power Seat 44 D is a standard Economy Class seat whose proximity to the lavatory and galley may be bothersome. 44 F None No Power Seat 44 F is a standard Economy Class seat whose proximity to the lavatory and galley may be bothersome. 44 J None No Power Seat 44 J is a standard Economy Class seat whose proximity to the lavatory and galley may be bothersome. 45 A None No Power Seat 45 A is a standard Economy Class seat that is in the last row of the plane and has limited recline. The proximity to the lavatory and galleys may be bothersome. 45 B None No Power Seat 45 B is a standard Economy Class seat that is in the last row of the plane and has limited recline. The proximity to the lavatory and galleys may be bothersome. 45 D None No Power Seat 45 D is a standard Economy Class seat that is in the last row of the plane and has limited recline. The proximity to the lavatory and galleys may be bothersome. 45 E None No Power Seat 45 E is a standard Economy Class seat that is in the last row of the plane and has limited recline. The proximity to the lavatory and galleys may be bothersome. 45 F None No Power Seat 45 F is a standard Economy Class seat that is in the last row of the plane and has limited recline. The proximity to the lavatory and galleys may be bothersome. 45 J None No Power Seat 45 J is a standard Economy Class seat that is in the last row of the plane and has limited recline. The proximity to the lavatory and galleys may be bothersome. 45 K None No Power Seat 45 K is a standard Economy Class seat that is in the last row of the plane and has limited recline. The proximity to the lavatory and galleys may be bothersome. Oman Air offers Audio Video on Demand in all classes. Oman Air offers Audio Video on Demand in all classes and live satellite television. Televisions are 23.5 inches in First Class; 17.5 inches in Business Class and 10.6 inches in Economy Class. There is regular AC power onboard: one power port per First and Business Class seat and one shared between two seats within Economy. This aircraft features Wi-Fi connectivity provided by OnAir, which allows passengers to pay for internet access using their credit cards. 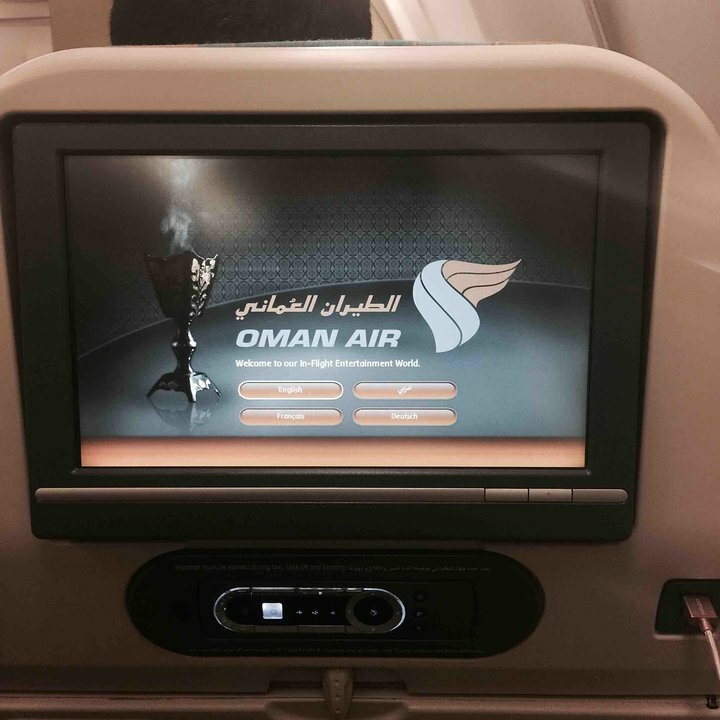 This aircraft is fitted with Oman Air's new interior with Audio Video on Demand in all three classes. Seemed to be a two class service with nobody in "first class" arranged in a 1-2-1 configuration with two sections of business class the forward one seating 8 passengers and the rear one seating 12. 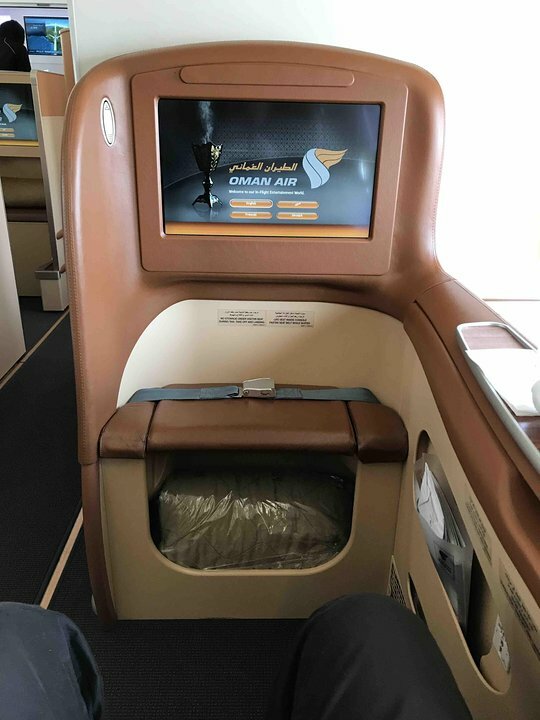 Oman air had crammed all business class into the forward section for the cabin crew's own convenience leaving the rear section empty, as a result I had to endure the prolonged conversation from my adjacent seating companions together with one passenger who snored loudly. There are no overhead lockers for the two middle seats and the largish lockers between the window and window seat substantially reduce the width of the latter. Seat was reasonably comfortable, quite refined dining but aspects of the service needs improving ie Glasses left for hours without being collected. Infrequent top ups of wine. This should be considered a good seat. Due to the tapering of the tail, it is possible to stretch your legs out fully although the seat is slightly offset from the one in front meaning that the tray is slightly offset. Oman Air flies 1 versions of Airbus A330-300.